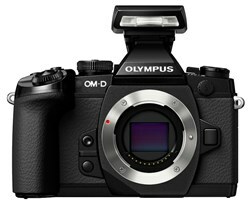 Olympus today announced an exciting new flagship camera, the OM-D E-M1, available now for pre-order from leading camera and electronics retailer Adorama: http://www.adorama.com/results/olympus-flagships. This revolutionary mirrorless, interchangeable-lens compact camera features a dust, splash and freeze-proof magnesium alloy body construction, 16MP Live MOS Image Sensor, dual phase/contrast autofocus, in-body five-axis image stabilization, and an intuitive control layout with customizable direct control buttons, offering an extraordinary photographic experience for professionals and serious photo enthusiasts alike. Engineered to ensure photographers never miss a shot, OM-D E-M1 boasts the powerful new 16MP Live MOS Image Sensor and Dual Autofocus combining Contrast and on-chip Phase Detection AF. Adding to its outstanding technical capabilities, EM-1 is the first OM camera to offer an X-Sync socket mechanical shutter release, 60-1/8000 second plus bulb and "Life Time" modes burst rate up to 10fps. The new OM-D E-M1 comes equipped with built-in Wi-Fi capabilities. Photographers can use the Olympus Image Share (O.I. Share) application to easily share images or a mobile device, such as smartphone or tablet, to control AF and shutter. Data obtained with a mobile device can be added to images. The E-M1s in-camera creativity features 12 Art Filters, HD Movie, Interval Shooting, Time-lapse photography and more. Normal, everyday scenes can be enhanced in various ways with new features, such as Color Creator and HDR Shooting, allowing photographers to have even more ways to expand artistic possibilities. Surrounded by a system of lenses and accessories, photographers can choose from 32 Olympus lenses and 57 lenses from all of the Micro Four-Thirds consortium members. Photographers will also find an assortment of new accessories including a new battery grip, wirelessly controlled flashes and more.